What a great post and reminder to emulate our Heavenly Father :o) – something I am seeing lately that I need to do more of, rather than focusing on myself and trying to act/be how the world thinks I should be. I just felt your post very heart touching and it seemed that you love your dad a lot. It was a very emotional post by you and i best part of it was that you have prepared it very well. I loved this, Miss Lynn. I don’t think I ever began to learn about God until I had kids. To know that what I feel for them can’t even compare to what He feels for me is a great source of strength. We adopted both our children, so they don’t have “look-alike or act-alike” genes. That made raising them an extra challenge, especially since they both have ADD, one has depressive tendencies, and the other has OCD. So I guess it’s not so much about genes as it’s about following the example of our Parent, Role Model, and Best Friend. 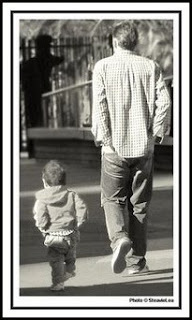 What a great post … thanks for reminding us about our Father’s love, and how we need to look more and more like Him. This is beautiful Lynn! I believe I am much like my mom. My sister is just like my dad. However, I really desire to be like my Heavenly Father. Spending time with Him and yielding it all to Him is a great start. I love when He works in me and through me to reach touch others. In my humanness I am weak but in Him …it’s unlimited. What a beautiful post! And a great reminder of everything the Father does for us.